Certificsate we have got : # ISO 9001, ISO 14000 # Our company has been inspected and certificate by EMC # CE And EN14511, EN 14825-ERP for heat pump exported to europe # Energy label for all heat pump models sold to oversea market # Testing laboratory calibrated by CNAS Our leading products Air to water heat pump, DC inverter heat pump, High water temperature heat pumps Monoblock house heating heat pumps, Split heat pump, Super low noise heat pump Heat pump dryer, Ground source heat pump, water to water heat pump, swimming pool heat pump Meeting series heat pump use well selected and tested world famous brand components to assure stable and efficient performance. Meeting series heat pump can control a 3 way valve to divert house heating and producing domestic hot water. Domestic hot water is priority. 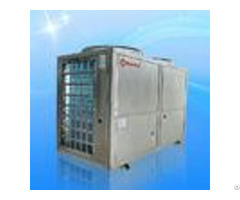 Meeting series heat pump can work with various Meeting tanks for domestic hot water production. 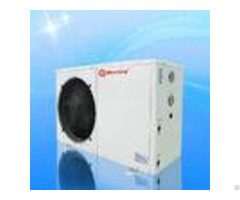 Meeting series heat pump can work with many kinds of auxiliary heaters such as wood-fired, oil or gas boiler. Auxiliary heaters could be switched on/off via heat pump signal. Meeting heat pump could be started up via an existing thermostat. It also results in less supplementary heating to cover the full heating demand on the coldest days. Two speed energy saving fan motors. The speed of fan varies so only the required amount of air is utilized. The blades are specially designed to move as much air as possible at the lowest noise level. Timer ON/OFF Automatically turn on electric heater in pre-set time period to heat water up to pre-set temperature to prevent Legionnella Smart defrost Varied heat curve. 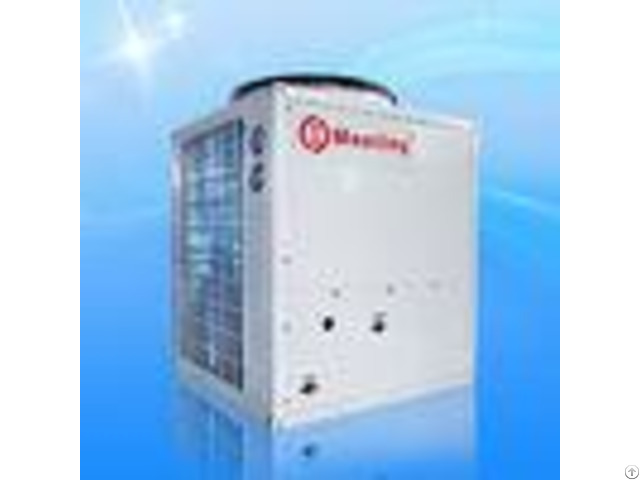 Heat pump heating water temperature will change automatically according to outdoor temp. to let you feel comfortable all the time Most components are well sealed to retain heat and prevent dripping. 1. Complying with ISO standard. Quality Ensured. 2. Complete Inspection for each unit before out of factory, covering water system and electricity detection and testing, ensuring 100% right product before shipment. 3. Strict quality control during production. We have liquid soap detection, halogen detection, electrical detection and water-soaking detection during production to avoid gas leakage and electrical problems . 4. Full inspection on bigger parts such as compressors, condensers, evaporators, expansion valves, flow switches, controllers etc.. Selection inspection for small parts such as sensors, pressure switches etc.. 5. Well noise control by using mute cotton for casing plates and soft rubber feet for floating compressors, some of the models use compressor isolation shields. 6. Well insulated with insulated cotton for every pipe and parts, include compressor, dryer filter and each pipes. 7. We have passed TUV and SGS inspections. We have CE, RoHs, IEC, CCC, CB certificates for most of our products. Some of our products have en14511 test, en14825 test. . After-sales service 1. Technical support for your installation, operation and maintenance. 2. Standard warranty time: One yearswarranty for heat pumps You can also pay for extended warranty or we can renegotiate the longer warranty period. 3. Spare parts and technical support at most economic prices after the warranty. FAQ Q1. Can I have a sample order for Heat pump or Water tank? A: Yes, we welcome sample order to test and check quality. Mixed samples are acceptable. Q2. What about the lead time? A: Sample needs 3-10days, mass production time depend on the products'quantity. Q3. Do you offer guarantee for the products? A: Yes, 12 months since the heat pump depart from the port of loading (Refer to the Bill of Lading).